Have you ever had raccoons fall through your ceiling? Discovered a nest of sparrows in your hanging flower basket? Or how about woke up one morning to discover deer have nibbled on your flower garden, reducing your blossoms to stems? If so, you're not alone. The paths of humans and wildlife cross all the time, and it is the aim of this handbook to make sure those paths cross as peacefully as possible. Andrea Dawn Lopez, a former manager at Wildlife Rescue and Rehabilitation, Inc., in San Antonio, Texas, has distilled her knowledge of dealing with wildlife in When Raccoons Fall through Your Ceiling. She tackles a wide variety of situations that occur when human and non-human worlds clash. Have you found a baby bird on your porch? Is a snake taking up residence in your garage? Or perhaps woodpeckers are drumming against your house? Lopez offers advice on how to deal humanely with each situation with tips on relocation, repelling, and when to call in the experts (for when the bears are rattling your trash cans). Wildlife rehabilitators and state wildlife officers across the world spend many hours answering questions on the phone, teaching in classrooms, and going to people's homes to try and show them how to better co-habit with wild animals. 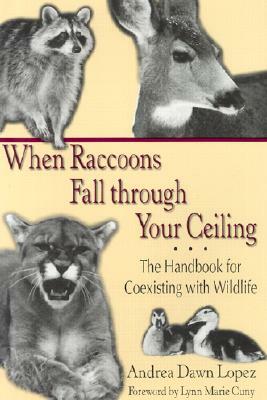 When Raccoons Fall through Your Ceiling is a practical handbook to codify for the general public how to deal with wildlife-related problems and concerns. It will be of interest to wildlife rehabilitation centers, state wildlife agencies, veterinarians, and those fortunate enough to live in an area enhanced by wild birds, reptiles, and mammals.